agenda freeware downloads for Windows Mobile Phone. Summary: This application allows to see the schedule of the company's salespersons, and enter incidents, orders and new customers. 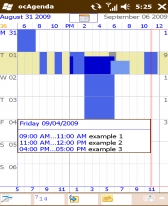 Summary: TodayAgenda displays appointments and tasks on your today screen up to 30 days in advance.